In 2 weeks time, many monuments in the Netherlands will be open to the public as a part of the National Open Monuments Day (Open Monumentendag). This years motto is 'Old building, new destiny', and aims to let the public discover how old buildings get a new destiny. I signed up to be a volunteer for the Amsterdam Monument Days and will be helping out as a guide in the Bank on Saturday the 10th and Sunday the 11th of September. 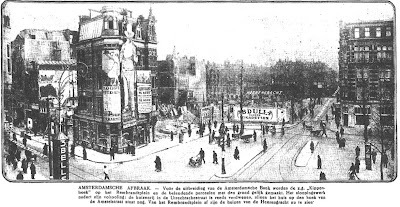 As a part of my preparations I tried to get a grip on how the Rembrandtsplein developed over the years and how the Amsterdamsche Bank evolved over time. 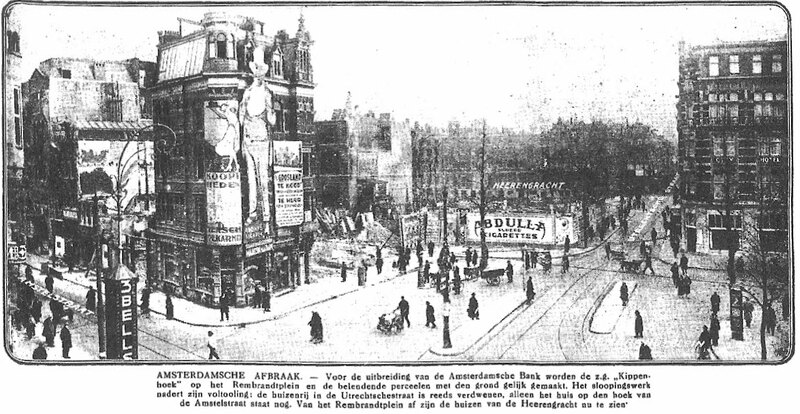 I discovered that the area of the Rembrandstplein where they built the Amsterdamsche Bank was previously called the Kippenhoek ('chickens corner') due to the presence of the chicken-market there. And I picked up some older photo's from that area. We should note that this building was close to the Turfmarkt where the central bank was located and also near to the stock exchange building on Beursplein 5. And it could be considered a smaller cousin of the other new bank building in the Amsterdam city centre: the Bazel (headoffices of the Nederlandse Handelmaatschappij). Both buildings marked a change in building styles for banks. Over the years, the Amsterdamsche Bank merged with Incasso Bank (a takeover) and a merger with Rotterdamse bank lead to the AMRO-Bank (AMRO for Amsterdam-Rotterdam). And the head office of the AMRO-bank had to keep up with the growth. So in the 1970s the architects Zwiers and Fontein doubled the volume of the building by adding a roof ('the tent camp' in ugly white duplex), closing the atrium inside and replacing it with regular floors and by adding the neigbouring buildings. In particular the addition of the extra roof on top of the old building led to quite some protests in the city. In 1987 the AMRO moved its headquarters to the South-East side of Amsterdam and thus became one of the first banks to initiate a move away from the prestigious city centre. As the bank merged with ABN, it became ABN-AMRO. And around 2001, ABN-AMRO decided to sell off its buildings in the city centre. Which lead to the question, what to do with the building. A number of plans passed around the table (among which the idea to make a huge hotel) until the Kroonenberg Groep decided to invest heavily in making it an up-to-date building. Aided by architects Kees Rijnboutt en Frederik Vermeesch they have done a great job in restyling the building. This wasn't easy. At first they wanted to kick-off the ugly tent-camp in top, but as it was part of the historical elements of the building, it had to remain. So they decided to change the material and throw in quite some changes to make the building fit in the surroundings better (see their website for a number of articles about that- in Dutch). One very clever thing they did, was open up the former Atrium inside, letting the light back in. This immediately gives the building much of its grandeur and openness. But it wouldn't be fun if there was no mystery left. 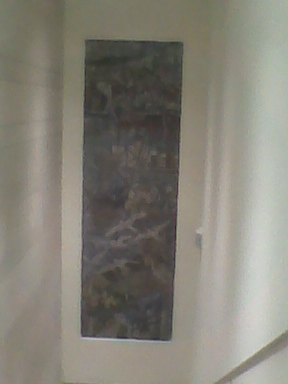 And the remaining mystery of the building is the Mosaic below. The architects have been unable to determine who made it or gave it or added it to the building. And I myself am also quite curious. So anyone who knows... please let me know.